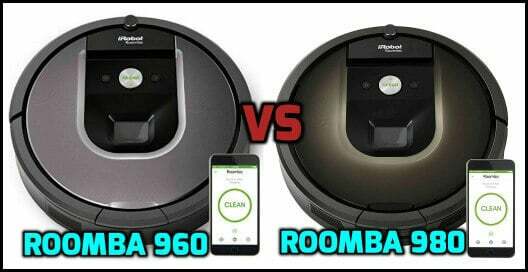 Roomba 960 vs 980 – What is Best for You? Last Updated: December 02, 2018. Are you looking for the best robot vacuum and from the industry leader Irobot? That: Roomba 960 and 980 are the top priorities deserved to be on your checkout list. Well, As you landed on this page, you are already on the way to get any ONE top-of-the-line robot vacuum from these two. But, there is a problem. What to go for (Roomba 960 OR Roomba 980)??? That is why we have created this “Roomba 960 vs 980” comparison guide. In this guide, we compared the two models with side by side comparison chart and with key differences compiled in-depth, helps you find the best Roomba for your home. If cleaning carpets and rugs (exceptionally well) is your main concern, then Roomba 980 is the recommended one for you. Otherwise, please don’t waste your time, don’t waste your extra bucks, go for Roomba 960. MOST RECOMMENDED for THE MOST. Check 960 price here. On a full charge, the Roomba 960 runs for around 75 minutes (battery life), where the 980 runs for 120 minutes (battery life). The Roomba 960 is with the same 800 series motor with 5x air power, while the 980 armed with the advanced newer motor, with 10x more suction power. Roomba 980 has an automatic carpet boost technology option, where the 960 does not. Included Accessories: Roomba 980 comes with 2 virtual wall barriers, where the 960 comes with 1. The Roomba 960 is usually 200$ cheaper than Roomba 980. Keep studying for the differences explored in-depth. And if you don’t have time to know all the major-minor feature differences, here is a link to skip to the conclusion. Both Roomba 960 and 980 models have same Irobot Home App. (With the identical features and user interface). Note: For Multi-OS users, there are apps for both Android and IOS platforms. The Best feature is the Wifi and App connectivity option for every robot vacuum. With the higher end models like Roomba 960 and 980, you get Wi-fi and app support, so that you can control everything from your smartphone. Scheduling, Remote Cleaning and changing any of the options all can be done with this app. Both 960 and 980 supports voice commands via amazon Alexa and google assistant. The app functionality is so cool. You can use the app to schedule cleanings, view logs, and change settings. And voice commands are used to start or stop cleaning, return the robot to its dock, and determine its status or location. Using the app you can make the robot vacuum run twice (or) thrice (or) more than that to make your home extra clean. BottomLine: App functionality is the same for both the Roomba 960 and the 980. Can You Use Roomba Without Wi-fi? Roomba 960 and 980 works without a home wi-fi network. But most of the advanced user-convenient features like scheduling, customized preferences, Cleaned reports, performance mode, extra cleaning passes, etc., can’t be used without an app and Internet (Wifi) connection. We strongly recommend making your home Wi-fi connected so that you can enjoy the best performance of these industry leading Roomba models. BottomLine: It wouldn’t make sense to use a $$$ robot vacuum without Wi-Fi Connectivity, Right? Both Roomba 960 and 980 came up with the same Lithium-Ion Battery but with different charge capacities. Roomba 960 armed with the 2130 mAh Li-Ion battery runs over 75 minutes while the 980 is armed with the 3000 mAh Li-Ion battery which runs over 120 minutes (2 hours). This is one of the major difference between the 960 and the 980. Note: We know both 960 and 980 have recharge and resume feature means when the battery gets drained out, the Roomba automatically recharges and continues with the job left to be done. So, to say, the battery life is not that much an important difference to consider. However for a larger house, Roomba 980 functions more economically. BottomLine: Roomba 980 works longer (45 minutes) than Roomba 960. Keeping customers needs and convenience in mind, Irobot is quite successful in designing 960 and 980. The large cleaning buttons up top and target clean buttons make these models easier for OneTouch use than previous Roomba models. Speaking of the ease of maintenance, both these models came up with brushless rollers called aeroforce extractors allows cleaning the floor to the great extent without those traditional brushes. To say, this is the major reason why we recommend 960 and 980 to the most, compared to the lower end models. These brushless rollers require less maintenance. Like with the other lower end models (i.e 600, 700 and 800 series) you don’t have to pick the dust and pet hair matted with the brushes. And also these tangle-free surface brushes work with dealing with all types of hair and ensures that the buildup of dirt will not damage the Roomba. Replace the HEPA Filter every three months. It makes sure your home allergic free. Irobot advises emptying the dustbin when the app prompts. But we recommend to empty it after every use for the best performance. Make sure your home clutter-free. Replace all the path obstacles like cords, bar stools etc., So that your Roomba doesn’t have that 0.0001% probability of stuck out. Bottom Line: Both are superior in terms of less maintenance needed. Needless to say, 960 and 980 both models designed to makes your life easier. 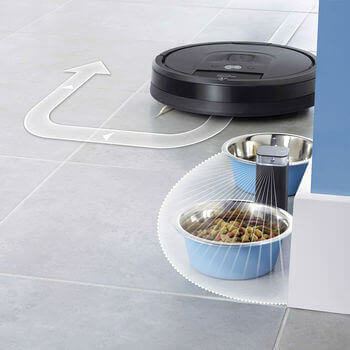 No need to say that, suction and cleaning power will vary depending on what model of robot vacuum cleaner you go for with a variety of Roomba models available. Considering the suction powers of this top-spec Roomba models, 960 and 980 costs the better part of the price. Roomba 960 uses the Aeroforce three-stage cleaning system and the 980 uses the same cleaning system but with power boost mode. Roomba 980 has a more powerful motor which provides up to 10 times the air power and also automatically increases the performance of its 3rd generation motor on carpets and rugs. Where the Roomba 960 features the same generation 2 motor as the old Roomba models provide up to 5 times the air power. BottomLine: For normal floors like with hardwood floors, the suction power difference between 960 and 980 is not at all a thing to look out. As both works identical. But to say, it is likely that the 980 will be a better buy for folks with lots of carpets in their home. HEPA Filter: Great for purifying the air. Brushless Rollers: forget hair getting tangled inside the brushed dust extractors like with the older models. But for homes with serious hair shedding pets, we recommend Roomba 980. As it has 10x stronger suction which helps the Roomba extracting the pet hair to the maximum. And also the Roomba 980 has carpet boost technology with more suction force than normal floors helps the Roomba to pluck the pet hair hidden deep inside the carpet more easily. BottomLine: In this case, Roomba 980 beats Roomba 960. Visual Mapping, what that means is both 960 and 980 have cameras and sensors such that they navigate by developing a map and then developing a cleaning routine which is very systematic, efficient and very deliberate way of cleaning. Older versions don’t have this feature, where the older Roombas were more or less random in their approach to navigation. Simply, it makes the robot learns and adapts to your home as it goes in order to move more effectively and efficiently. Both the models 960 and 980 came up with an up top brand new camera that helps map your rooms which keep the Roomba from running full force into the objects. BottomLine: 960 and 980 both have this feature built-in. As per Irobot, both these Roomba models 960 and 980 are designed to clean around 2000 square feet and more than that. With the help of armed visual mapping technology, both 960 and 980 are capable of cleaning multi rooms. The only difference is time. On average, talking about 960, the cleaning time for a 2000 square foot home was just under 3 hours total including the charging time. Where the 980 takes much less time as its battery life is 45 minutes more compared to the 960. “Set it to work, Forget it, and Let it CLEAN” – This is the main motto of robot vacuums. And to be honest, for the older Roomba models (800, 700, 600 series) some supervision is needed. But with these advanced models 960 and 980 (the big brothers), the motto got really alive. Speaking in-detail if the Roomba (960 or 980) runs low on battery, it will go back, recharges itself and vacuums the spot that is missed, ensuring that your entire house every square inch will be vacuumed everyday GUARANTEED. To direct, this recharge and resume feature makes the Roomba completely independent, so that you do not have to worry about the recharging (i.e plug-in, plug-out and battery low issues) manually. Bottomline: Both Roomba 960 and 980 came up with this feature. We all love to walk on a carpeted floor. At the same time, we all know that it is very hard to clean the carpets. Especially if you are in the home with shaggy pets, it is much more difficult. In that case, not all robot vacuums work like a pro. But Irobot has a solution for it. Irobot released the 980 model, the only model with carpet boost option. Carpet Boost: Whenever the Roomba moves on to the carpets. It automatically detects and shifts to the carpet boost mode for providing the best possible cleaning, vacuums with high power compared to a normal mode. It’s really a big deal for the carpet owners. BottomLine: Roomba 980 beats Roomba 960 in this case. The 960 does not have carpet boost option. But for thick carpets cleaning, Roomba 980 may damage your carpet piles and reduce its age. Be attentive. If you have hardwood floors in your home, then this article will be your destination one. Thing is it is easy to clean the hardwood floors as it is to clean the carpeted areas. And not all robot vacuums are best enough picking up the dust and debris to the maximum extent. Also, there is a huge chance of missing the dust spots to be cleaned. But here is the good worthy news for you: Both the Roomba 960 and 980 are very powerful and brilliant, simply excels cleaning hardwood floors. Dirt, dust, and debris won’t stand a chance against these powerful robot vacuum cleaners. And also keep in mind, if cleaning hardwood floors is the only criteria, then it is better not to go for 980 (As it saves $200 to you). The 980’s Carpet boost option is also a useless feature for hardwood floor owner. BottomLine: Both 960 and 980 are great working on hardwood floors. Every Roomba model will come up with the side brushes which sweeps all the corners, edges and other hard to clean areas effectively. To say, Roomba is round shaped. 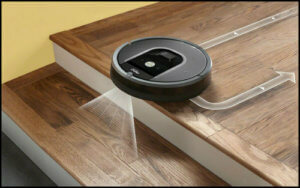 Usually, D-shape designed robot vacuums like Neato Botovac delivers better cleaning ability around edges and corners. But no need to worry, Roomba’s spinning side brushes will do the best work for you. BottomLine: Every Roomba is identical with this feature. Another great feature of these Roomba vacuums is they know where the stairs are which means on its approach it will stop itself dumbling down. The Cliff detecting sensors will prevent the Roomba from falling down areas like stairs and other drop-offs. Bottomline: All Roombas have this in common. Both Roomba 960 and 980 came up with the virtual wall barriers, the number varies (Roomba 960: 1, Roomba 980: 2). One is virtual wall mode. If you’ve got a room beating down the Roomba going into, put into that first mode, put it by the door of that room and the Roomba will never go part of it. And the second mode is a halo mode like a protective 2-foot radius mode. Talking about it, if you’ve got a valuable item (or) a place where you don’t want to clean, put into the second mode and put it right where you want. Then you’re safe in the knowledge knowing that the Roomba won’t go within those two feet. Bottomline: The Roomba 960 comes with only one virtual wall barrier, one less than the 980. And also for both, you will get one extra filter and one extra side brush. Performance is nearly identical to its expensive brother Roomba 980. Usually costs $200 cheaper than Roomba 980. Wi-fi and App connectivity enabled (smart home connected). The Best powerful (5x more suction) Roomba with Google Assistant and Amazon Alexa Support. Overall positive reviews on Amazon. The Best Robot Vacuum available on the market today (Has an advanced generation motor provides 10X more powerful suction compared to a regular Roomba). Running time (battery life) is 2 hours, 45 minutes more compared to the 960. The only Roomba, not, the only robot vacuum with carpet boost option. Makes it the best buy for people with lots of carpets in their home. Roomba 980 comes with two virtual wall barriers, worth $50 each to buy separately. Easy to maintain and quieter one compared to the Roomba 960. Looking for the budget-friendly Roomba, then check out here for the best Roomba models comparison. Both the models 960 and 980 has more standard and advanced features than any other robot vacuum on the market. For the most, we highly recommend getting Roomba 960. As it works nearly identical to the Roomba 980 and also saves your hard-earned money ($200), it is always the clever way getting Roomba 960 on Amazon. And especially if you are in the house with hardwood floors, Roomba 980’s carpet boost option and powerful motor (worth $200 more) are completely unworthy of cleaning. Simply the ideal option for people with hardwood floors. And If you are mainly concerned cleaning carpet floors (or) in a home with a lot of rugs to be cleaned daily effectively and efficiently, then Roomba 980 is the recommended choice for you.